USDCHF broke below 1.0715 support, suggesting that lengthier consolidation of uptrend from 1.0132 is underway. Range trading is expected in 1.0608 and 1.0898 in next several days. Key support is at 1.0608, as long as this level holds, one more rise towards 1.1000 is still possible after consolidation. However, a break below 1.0608 level will indicate that the rise from 1.0132 has completed at 1.0898 already, then deeper decline could be seen to 1.0500 or even lower. Today, it is a pleasure to bring you a new forex interview with long-time forex trader and analyst Sean Hyman. A financial career spanning over 17 years in currencies, stocks and commodities, Sean’s background includes working as a stock broker at Charles Schwab and for the large forex brokerage, FXCM. Sean has also written for numerous financial websites and currently provides forex insight for the Money Matrix Insider and World Currency Watch, where he is the resident “Professor FX”. I’d like to thank Sean for taking the time to answer our questions. A long time ago, I read about a trader in the book “Market Wizards” that traded currencies. It was way back then that I learned that they traded 24 hours a day without commissions and generally with less slippage. That was an awesome change from the stock market that traded 6 ½ hours a day and had both buy and sell commissions and you could count on a decent amount of slippage on many of the trades. So went I saw all of the advantages of currencies over stocks, I was hooked! How would you say you got your “forex” education? Did you learn by demo trading, did you have a mentor? etc. At first I read things like Currency Trader magazine, etc. but then later on I went study an online forex course at www.fxcm.com . That’s where I got my “well rounded” forex education. Aside from that, I’d learned how to use technical indicators in the stock market and so I was able to transfer those technical analysis skills into the currency market. It’s funny that you mention about demos…I only used them to learn how to execute currency orders, etc. After that, I started a small live account because I knew that the psychological level was never engaged in demo trading and that’s why people will be successful in demos and not in their live account sometimes. How often do you trade, are you a full-time trader? Do you trade longer or shorter times? I’m the Dailyfx.com Forum Moderator and I also run two forex newsletter services (the Currency Cross Trader at www.worldcurrencywatch.com & the Money Matrix Insider at www.moneymatrixinsider.com ). So all of that keeps me trading in the midst of “talking shop” with traders on the dailyfx.com forums and researching for my next trades. I tend to put on 1-2 trades every couple of weeks. Most of these trades are swing trades that last at least “days to weeks”. I usually only have 1-2 trades on in the market at any one given time. I tend to use the daily chart’s trend as my “directional gauge” to trade in…and the 1 hour or 4 hour chart to trade off of (to enter the trade in). Do you have any preference on the currency pairs you trade? Honestly, I will trade most any of the 40+ pairs that FXCM.com offers on their trading platform. I scan through all of the daily charts. My goal is to find the prettiest trend…one that can be seen from across the room. Once I’ve narrowed those pairs down to the best couple of charts out there, I look for opportune entry points on the 1 or 4 hour charts. If there’s not a high probability set-up then…I sit on my hands until there is one. Pros don’t feel the need to trade at just any time. It’s taken me a while to get to that point (years actually). Do you use more technical analysis or fundamental analysis, both? I have four main parts to my analysis: Sentiment …what is the mood of the market. Are traders in more of a “risk seeking” mode or more of a defensive “risk aversion mode”. If they are in “risk seeking” mode, then I know that the pairs will respond to fundamentals. If the market is in a defensive mode, then I know that I can only rely on technicals. In a stable market, I technically trade the best fundamental currencies. It would be like a stock trader ONLY choosing to trade the companies with the best earnings outlook. Once I’ve found my pair and the trade set up, my final piece of the analysis is the “risk analysis” which some call “money management”. Its how many lots to trade and how wide my stops need to be. I never risk more than 5% of my account balance on any trade if I were to be stopped out. So just to recap those 4 points: Sentiment…then Fundamentals, then Technicals, then Risk Analysis. Do you have any favorite economic or favorite technical indicators that you feel are most reliable? With fundamentals I watch the CPI year over year data, interest rate announcements, GDP and the employment reports. I look for this info at www.tradingeconomics.com and at www.dailyfx.com. On the technical side of things, I look to the 50 or 200 day Simple Moving Average and the Slow Stochastics 14,3,3 settings mainly. Sometimes I’ll use the Elliott Wave Oscillator as well. I also love to see what the DailyFX SSI (Speculative Sentiment Index) reading is too. I love to enter trades where there is a strong trend and the SSI reading gives an extreme reading that shows the retail traders are trying to “fight the trend” by attempting to pick a top or a bottom. This is the dumbest thing a trader can do. However, it gives me a very high probability trade as I stick with the trend and they get stopped out, margin called out or scared out. Either way, it’s the “fuel to the fire” for my trade. Pros know to stick with the trend. The novice says, “Its gone too far and has to turn around.” Therefore they try to be a “bottom picker” or a “top picker”. Once someone has been in the markets for over 17 years as I have…you learn who lasts and who doesn’t. The trend traders stand the best chance of lasting because trends are more likely to continue on than they are to reverse. Bottom and top pickers are always executing low probability trades and rarely last over the “long haul”. You have also been a stock trader and a commodities trader. Are there specific stock indexes or commodities markets that you feel that forex traders should always keep an eye on? Yes, I was and still am also a stock trader. I trade stocks and commodity ETFs for my longer term retirement accounts and use forex for my near term to medium term trading account. I watch the Dow, S&P 500 and NASDAQ. I also watch gold, oil, copper a lot too. Depending on how these commodities are doing will weigh heavily on how the “commodity dollars” like the Australian dollar, New Zealand dollar and the Canadian dollar do. Since those countries are all major commodity exporters, they generally trend in the same direction as the commodities themselves. Also, commodities & stocks tend to have a fairly strong inverse correlation to the U.S. dollar. The euro (generally) tracks along with stocks fairly well too. Now with all of the Greece problems creeping in, the euro has tanked before stocks have. On the forex market and particularly on the US Dollar, we have seen the dollar stage a rally since the end of 2009, do you think we will see continued Dollar strength through 2010? Yes, I do think that the dollar rally is likely to continue because interest rate hikes are closer than they were in 2009 AND also because I believe that stocks will tank again later on this year and that money will run to the defensive side…into the world’s reserve currency…the U.S. dollar. With banks not lending as they should…sustained high unemployment…higher taxes coming from the Obama administration and higher interest rates coming…I don’t see how corporations are going to expand their profit margins and businesses in that type of environment. Therefore, I’d imagine a double dip recession is going to unfold and stocks will head back towards their lows. This would all be supportive of the dollar. NOW, with that said…if that doesn’t pan out and the dollar breaks its uptrend, I’m just as willing to short. Ultimately, I always want to stay on the side of the trend. I’d always rather be wrong in my opinion of where things are headed and have to change directions to stay on the side of the trend and still make money. On the global forex stage, are there any particular currencies out there that you feel may be undervalued and/or may be poised to outperform? Or vice versa, currencies that may be ready to decline? The euro is still overvalued in my opinion. It will likely fall much further (even more than it has already). I think both the dollar and the yen will continue to rise in this shaky, volatile type of environment. In conclusion, do you have any advice to anyone starting out in forex trading? Is there anything in particular that you wish you had learned when you started out? Don’t wing it. Get an education. Heck, you can take a course online at fxcm.com for $20. If you’re an active poster on dailyfx.com, you can sometimes even get it for free. Tap into the mentors aka instructors there. They are some of the best I know. Start with a well capitalized account. Let me be more specific. Trade a MAX of 1 mini lot per $5,000 in a mini account OR trade a MAX of 1 micro lot per $500 in your account. Use wide stops and few lots. Trade over days or weeks and not intraday. Risk no more than 5% of your capital on any one trade if you were to be stopped out. Trade with the trend. Don’t know the trend direction? Slap a 50 or 200 day SMA on the daily chart and trade in the direction that it points to. Take only entry signals in the direction of that trend. NEVER trade counter to the trend. Trade trends, not news events. Buy the best technical uptrends on the currencies with the strongest fundamentals. Sell short the best looking downtrends with the currencies that have the absolute worst fundamentals. Don’t put a ton of indicators on your chart. If you have more than 2-3 on there, you have too many on your chart. What the price is doing is more important. Indicators show you what the price is likely to do. The price action on the chart shows you what the pair is doing. Identify the trend FIRST, then look to the indicators below your chart. Many traders focus on the indicator first (which is a mistake) and they forget about the most important thing…the trend’s direction. Remember that the risk management on the trade is just as important as picking the right direction on the trade. Pros are prudent risk managers. Novices are sloppy risk managers. Pros trade trends. Novices trade counter to the trend. Pros plan a trade before they enter it and place stops and limits from the start of the trade. Novices are emotional and are quick to click the buy or sell button without “thinking the trade through” first. They “wing it” once they are in the trade. Never “double down” on a loser. Never back your stop up and widen it. DO remove the risk to the trade once a trade has moved sufficiently away from your entry point. Pros trail their stop based off of what the pair has done up until now while novices try to predict the future and “hope for the best”. Pros “follow” trends…novices feel a need to “predict” and be right. Pros would rather respond to the market. Thank you to Sean for participating in this forex interview with us. EURUSD remains in downward movement from 1.5144 and the bounce from 1.3443 is more likely consolidation of downtrend. Range trading between 1.3443 and 1.3838 is expected next week. As long as 1.3838 resistance holds, another fall towards 1.3300-1.3400 area is possible. However, above 1.3838 key resistance will indicate that a cycle bottom has been formed at 1.3443 level on daily chart, and the fall from 1.5144 has completed. For long term analysis, EURUSD has formed a cycle top at 1.5144 level on weekly chart. Fall towards 1.3000 area to reach next cycle bottom is possible in next several weeks. For Elliott Wave International’s chief commodity analyst Jeffrey Kennedy, the single most important thing for a trader to have is STYLE— and no, we’re not talking business casual versus sporty chic. Trading “style,” as in any of the following: top/bottom picker, strictly technical, cyclical, or pattern watcher. Jeffrey himself is, and always has been, a “trend” trader; meaning: he uses the Wave Principle as his primary tool, along with a few secondary means of select technical studies. Such as: Bar Patterns. And, of all of those, Jeffrey counts one bar pattern in particular as his absolute, all-time favorite: the 3-in-1. For a real-world example of the 3-1 formation in the recent history of a major commodity market, take a look at this close-up of Cotton from Jeffrey Kennedy’s February 5, 2010, Daily Futures Junctures. As you can see, a classic 3-in-1 bar pattern emerged in Cotton at the very start of the new year. Then, within days of January, the trigger bar closed below the low of the set-up bar, signaling the market’s return to the downside. Immediately after, cotton prices plunged in a powerful selloff to four-month lows. Then February arrived and with it, the end of cotton’s decline. 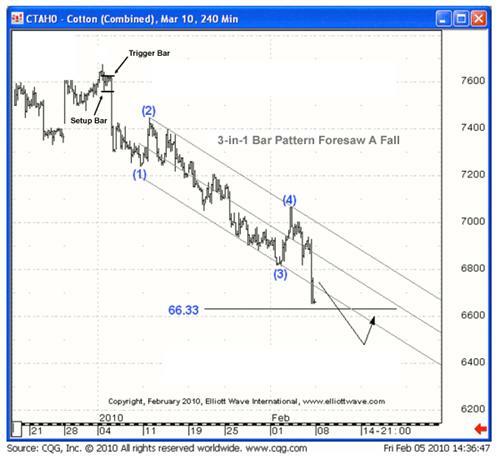 In the same chart, you can see how Jeffrey used the Wave Principle to calculate a potential downside target for the market at 66.33. This area marked the point where Wave (5) equaled wave (1), a common relationship. Since then, a winning streak in cotton has carried prices to new contract highs. What this example tells you is that by tag-teaming the Wave Principle with Bar Patterns, you can have a higher objective chance of pinning the volatile markets to the ground. 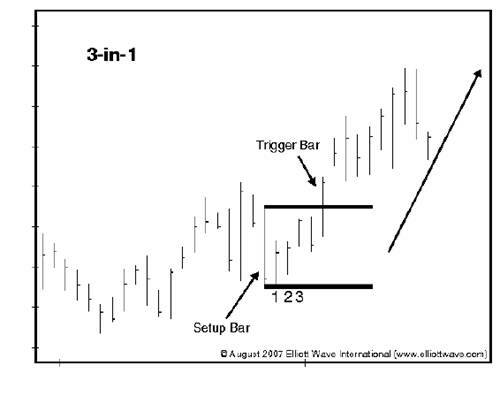 To learn more, read Jeffrey Kennedy’s exclusive, free 15-page report titled “How To Use Bar Patterns To Spot Trade Set-ups,” where he shows you 6 bar patterns, his personal favorites. Nico Isaac writes for Elliott Wave International, a market forecasting and technical analysis firm. The US Dollar has been on the defensive across the board today while the U.S. stock markets have advanced on a busy news day. The American currency has been declining today versus the euro, British pound, Japanese yen, Canadian dollar, Swiss franc, Australian dollar and the New Zealand dollar, according to currency data by Oanda at 3:28 pm EST in the U.S. session. The euro has mounted a comeback the last couple of days against the dollar after starting the week under heavy selling pressure due to the Greek debt crisis. The EUR/USD currency pair has traded as high as 1.3682 today from opening the day at 1.3536 and after touching a low of 1.3452 early on Thursday. The EUR/USD is currently trading close to this week’s opening exchange rate and could be on its way to reversing a six-week losing streak. The US stock markets, meanwhile, have traded a bit higher today with the Dow Jones advancing by 20 points, the Nasdaq increasing over 5 points and the S&P 500 up by close to 3 points at the time of writing. Oil has climbed higher by $1.32 to trade at $79.49 while gold has gained by $10.50 to trade at the $1,118.30 per ounce level. Today’s economic news showed that the U.S. economy expanded by more than originally estimated in the fourth quarter of 2009 and at the fastest pace in over 6 years, according to a release by the U.S. Commerce Department. The second government estimate showed that the U.S. Gross Domestic Product grew on an annualized basis by 5.9 percent in the October to December quarter following a real 2.2 percent growth rate in the third quarter. The previous estimate put the GDP advance at 5.7 percent. A significant contributor to the gain in GDP for the fourth quarter was a slowdown in the cutbacks of business inventories. Inventories fell by just $16.9 billion in the fourth quarter after a decrease of $139 billion in the third quarter and a decrease of $160.2 billion in the second quarter. This slowdown in the slashing of inventories accounted for adding approximately 3.9 percent to the GDP increase. The fourth quarter GDP numbers advanced by the highest growth rate since 2003 and surpassed economic forecasts expecting the growth to meet the prior estimate at 5.7 percent. Also contributing to the economic expansion was an increase in consumer spending which makes up roughly two-thirds of U.S. economic activity. Consumer spending rose by 1.7 percent (vs 2.0% in previous release) in the quarter after an increase of 2.8 percent in the third quarter. A gain in exports contributed positively to the GDP numbers as exports of goods and services increased by 22.4 percent (vs 18.1% previous release) in the quarter while imports advanced by 15.3 percent. Also released today, the U.S. existing-homes sales data fell more than expected for the month of January, according to the monthly report produced by the National Association of Realtors (NAR). The NAR report showed that existing-home sales including single family homes, co-ops and townhouses fell by 7.2 percent in January to a seasonally adjusted annual rate of 5.05 million units. Despite the monthly decline, existing-home sales increased by 11.5 percent an annual basis from the January 2009 level. Market forecasters had predicted the sales data would rise by 0.9 percent in January to a 5.50 million unit sales pace. December’s existing-homes sales had decreased by a revised 16.2 percent to a 5.44 million home rate. The median sales price for existing homes was $164,700 in January while total housing inventory decreased in January by 0.5 percent to a total of 3.27 million homes. After providing some signals for a bullish correction, the Pound seems to resume its bearish trend with full steam. A short analysis of the GBP/USD and the GBP/JPY crosses delivers the same conclusion – the Pound is going down. • Here are the GBP/USD and the GBP/JPY 1-day charts by forexYard. • The two charts look quote similar. This suggests that the currency that determines the trend at the moment for both pairs is the Pound. • It is also notable that all technical oscillators are pointing down at the moment, indicating that the bearish momentum is still quite strong. • The next significant support levels for the GBP/USD are located at the 1.5050 and the 1.4950. • The next significant resistant levels are located at the 1.5350 and the 1.5460. • The support levels of the GBP/JPY cross are 133.50 and the 131.10 levels. • The resistant levels of the GBP/JPY cross are 136.55 and 137.80. • If any of the crosses will manage to breach through two consecutive levels – it will verify the trend. By Anton Eljwizat – The GBP has dropped significantly versus the CHF in the past week, and it is currently trading around 1.6445. And now as evident in the data below, the 4-hour chart is giving bullish signals, indicating that the GBP/CHF pair might go up. Forex traders can take advantage of this impending movement by having their Entry Orders in place to capture this reversal. •	Below is the daily chart of the GBP/CHF currency pair. •	The technical indicators that are used are the William Percent Range, Relative Strength Index (RSI), and Slow Stochastic. •	Point 1: The Slow Stochastic indicates a bullish cross, signaling that the next move may be in an upward direction. • Point 2: The Relative Strength Index (RSI) indicates that the price of this cross currently floats in the oversold territory, signaling upward pressure. •	Point 3: The William Percents Range also supports the upward direction. • The volatile downward movement which occurred prior to this upward correction has generated these indicators, and there appears to be room for this correction to continue. Rumors of another possible downgrade of Greece by Standard & Poor convinced traders to sell the EUR in favor of higher yielding currencies like the Yen, as well as the EUR’s traditional rival, the USD. But the Dollar’s gains have become muted since Federal Reserve Board Chairman Ben Bernanke continued his testimony yesterday and reaffirmed keeping interest rates at record lows. While helping US stocks rise, the greenback has suffered a minor downturn. The US Dollar continued rising yesterday against all of its major counterparts except the Japanese Yen amid a distinct downturn in the Euro and British Pound. The greenback is currently trading at 1.3580 versus the EUR from yesterday’s start of 1.3525, and is rising back towards 89.40 yen from yesterday’s drop towards 88.70. Gains similar to those against the EUR were also seen versus the Pound with the buck presently sitting at 1.5276. Rumors of another possible downgrade of Greece by Standard & Poor’s has convinced traders to sell the EUR in favor of higher yielding currencies like the Yen, as well as the EUR’s traditional rival, the USD. But the Dollar’s gains have become muted since Federal Reserve Board Chairman Ben Bernanke continued his testimony yesterday and reaffirmed keeping interest rates at record lows. While helping US stocks rise, the greenback has suffered a minor downturn. Today’s news is going to be moderate for the US Dollar, relative to its European counterparts. Later in the day we’ll receive the US Preliminary GDP figures which are forecasted to show a decreasing speed of growth from 5.7% to 5.6%. The Existing Home Sales figures will also be released at 15:00 GMT and could potentially boost the USD with a small growth in housing sales. The Euro has been on the selling side of the trading equation for weeks now given the poor standing of a few of its member states. The 16-nation single currency is currently trading lower against all of its currency rivals from a lack of fundamental support. Against the Yen, the EUR is currently trading at 121.33 from 122.12 seen at the start of yesterday’s trading. Versus the USD, the EUR has fallen towards 1.3580 from the level of 1.3635 seen at this week’s start. Should Standard & Poor’s downgrade Greece once more in the coming month the EUR will likely not be able to exit its current slump until these debt concerns are solved. Given the current economic climate in Europe, this is not likely to happen in the near future. Poor economic outlook, declining consumer confidence and a decrease in lending all support the notion that Europe is facing a dismal first quarter. If things don’t pick up soon, the EUR may find itself in a bearish channel throughout the coming spring months. Euro-Zone news today is going to be somewhat absent amid the string of reports coming from Switzerland and the UK. The Swiss will be publishing their KOF Economic Barometer which may show a sign of increasing market sentiment, and could help the CHF in today’s trading. The Euro-Zone will be publishing its consumer price index (CPI) reports, but the figures will not likely carry a strong enough impact to reverse current trends. The Japanese Yen has been on the upside of current market fluctuations. The predominance of risk aversion has led the JPY higher against the majority of its currency rivals. Indeed, the Yen appears to be the only currency beating the US Dollar at present with the price reaching a 2-week high of 88.80 in yesterday’s closing hours. Fundamental data does not seem to support the majority of Japan’s recent currency gains. Core figures from the Japanese economy are still declining and the recent recall crisis for Toyota is damaging the desirability of Japanese industry. However, the JPY tends to fare well when the economy is performing badly, so the recent growth is supporting this notion. If Japan’s economy cannot turn around in the nearest future, the JPY could continue its bullish trend into the month of March. Crude Oil failed to find support above $80 a barrel in yesterday’s trading following a series of reports which helped boost the USD temporarily and put downward pressure on commodities. Crude Oil, Gold, Silver and Platinum have all been in decline since the greenback became bullish over a week ago on European economic woes. With Greece continuing to wreak havoc on the Euro-Zone’s regional economy, the Dollar stands to continue gaining despite Fed Chairman Bernanke’s recent testimony. Bernanke reconfirmed that the Fed would continue to hold interest rates at record lows, leading stocks to climb higher in yesterday’s trading while the USD’s boost was dampened. Europe’s declining growth and sovereign debt concerns mixed with a shaky US economic recovery have led many investors to assume that energy consumption may fall in the near future and this sentiment is being priced in. If the current risk-averse environment persists, Crude Oil may continue to come under selling pressure. The daily chart shows the pair has appreciated to a downward sloping trend line that begins on Jan 19th. The 4-hour chart shows the same downward sloping trend line, along with a potential bearish cross forming on the Slow Stochastic Oscillator. This indicates the potential for a downward move in the price. The 7-day Relative Strength Indicator is also floating in the overbought region and is moving lower, further supporting a price move lower. Traders may want to wait for the completion of the sell signals and enter the market near the trend line or at the resistance level of 1.3625. The pair has displayed an impressive bearish streak over the past month, but the charts are beginning to show some technical resistance. The weekly chart shows the potential for a bullish cross forming on the Slow Stochastic Oscillator, indicating the potential for a rise in the price in the near term. This is supported by the daily chart that also displays a potential bullish cross. Due to both charts forming potential bullish crosses, a greater significance should be placed on the oscillator and caution heeded before adding to any short positions in this pair. The 4-hour chart shows it might be time to liquidate any short positions. The price is currently approaching the downward sloping trend line that begins on February 19th. The Slow Stochastic Oscillator shows a recent bullish cross has formed, indicating the potential for the price to appreciate in the near term. Both the 14-day and 7-day RSI have dropped below the oversold level and have since breached the 20 level, indicating the potential for a rise in the price. The drop in the value of the pair has left the price close to the upward sloping trend line that begins on January 13th. This would be the 5th point of contact the currency pair has made with the trend line, making the line very significant. Buying at a significant trend line can be a good opportunity for traders to enter into the market a relatively good price level. The daily chart shows yesterday’s high price volatility did send the pair below the long term trend line that begins on February 5th, but the price breach failed to close below the trend line. This may present forex traders an excellent opportunity to enter into the market long on the recent price dip. GBPUSD breaks below 1.5350 support and the fall from 1.5815 extends to as low as 1.5190 level. Deeper decline is still possible after a minor consolidation and next target would be at 1.5000 area. Resistance is now located at the falling trend line from 1.5815 to 1.5575, as long as the trend line resistance holds, downtrend from 1.5815 could be expected to continue. The euro appreciated vis-à-vis the U.S. dollar today as the single currency tested offers around the US$ 1.3570 level and was supported around the $1.3450 level. The common currency reclaimed some recent lost ground as Federal Reserve Chairman Bernanke reported the U.S. dollar could be negatively impacted by the rapidly expanding public deficit that is now projected to reach 11% of gross domestic product by the end of the year. Bernanke implored Congress and the Obama administration to “find a solution” to the escalating deficit. The common currency scaled back earlier gains after a rumour circulated that Greece may be facing a credit downgrade. Greece is expected to sell some €5 billion in new ten-year bonds next week to refinance a mountain of maturing debt and will need to tap the capital markets extensively this year. Focus is now on the derivatives trades Greece entered into to be able to qualify to join the euro. Data released in the U.S. today saw January durable goods orders climb a stronger-than-expected 3.0%, up from a revised 1.9% in December, while the ex-transportation component was off -0.6%, down from an upwardly revised +2.0% in December. Also, weekly initial jobless claims came in on the weak side, up 496,000 from 474,000 last week, while continuing jobless claims printed at 4.617 million, up from 4.611 million. These data indicate the U.S. labour market is not really gaining any traction. Other data saw the December house price index off 1.6% m/m, down from a revised +0.4%, and was off 0.1% q/q, down from a revised +0.1%. Many data will be released in the U.S. tomorrow including Q4 gross domestic product, the February Chicago Purchasing Manager index, February University of Michigan consumer sentiment, and January existing home sales. In eurozone news, EMU-16 consumer confidence retreated to -17 in February from -16 in January, the first decline since the recent low of -34 in March 2009. Also, February economic confidence improved slightly to 95.9 from 95.7 in January and industrial confidence rallied to -13 from -14 in January. Additionally, it was reported that German February unemployment remained steady at 8.2% with 7,000 jobs lost. Moreover, M3 money supply was up 0.1% y/y in January. Euro bids are cited around the US$ 1.3335 level.